Your spouse has taken up a new hobby recently, cooking has now become their favorite thing to do. This should really be no surprise, cooking and baking have become a hobby more than a chore in recent years. Cooking at home can save money, it’s a healthy alternative and quite frankly, it can be a whole lot of fun. Of course, taking up cooking as a hobby requires all of the necessary tools of the trade. No doubt the aspiring chef in your family has at least the basics, a chef’s knife, quality pans and cupboards full of various spices. But we imagine there is a lot of things that they still need to expand their craft. Well, Christmas will be here soon and it gives you the perfect opportunity to present your spouse with gifts for the kitchen. If you are having a hard time figuring out what to get the chef of the family for Christmas, we can help. Here are some great gift ideas. This might be a little steep for some, but it also might be something that should have been done a long time ago. 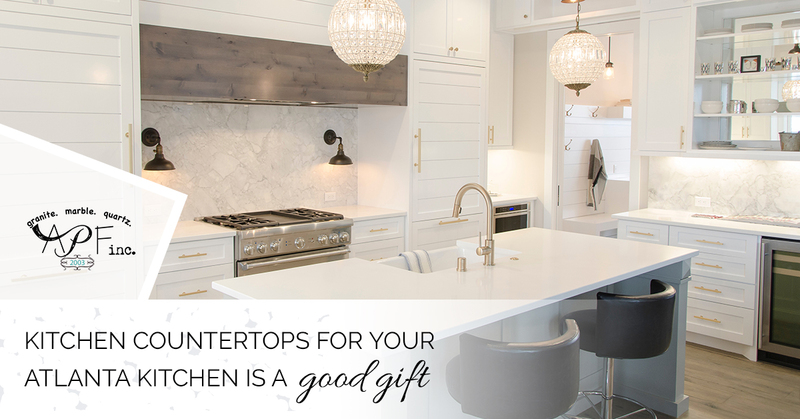 If your kitchen is outdated, how do you expect your better half to thrive in their craft? A remodeled kitchen is every chef’s dream. It would be the best gift ever. But if that is not in the picture, the least you can do is have the kitchen countertops replaced by A Polished Finish on Atlanta. New countertops will give your kitchen a new look and a great surface for the cook to work on. Any home worth its value in salt already has a chef’s knife in the arsenal of cooking tools. But what about the quality? Is the chef’s knife you have now some markdown item from Walmart? If so, you need to look into gifting a quality chef’s knife this year. The good news is that whatever you are willing to spend, you can usually find a decent knife in that price range. When searching for a chef’s knife, you want a well-balanced workhorse, a knife for the ages. You want a knife that is sleek in design, a high-precision tool that slices see-through sashimi. You want to choose carefully. Every kitchen needs an iron skillet. Every seasoned chef (no pun intended) knows how valuable an iron skillet is to the craft. This is one piece of kitchen equipment that is unmatched in terms of durability, functionality and versatility. Plus, they are heavy, dude, real heavy. The purpose of an iron skillet is far greater than just to cook a burger or bake cornbread. It has unlimited potential and every aspiring chef needs one. Essentially, a stand mixer is as good as another set of beefy arms in the kitchen. Whenever you could use a helping hand with a mixing task, a stand mixer is there eager to help. A stand mixer is the quickest and most efficient way to combine ingredients, mix things up and cut down on your prep time. This means dinner can be served on time every evening. There are a lot of choices out there as far a brand, size, horsepower and color, so get cracking if you are considering this as a gift. A long time ago, everybody used a wood cutting board. And then, people began using plastic cutting boards and they became super popular. The government stepped in and make eateries use plastic cutting boards thinking they were safer. As it turns out, they were wrong. Plastic cutting boards are no safer than wood cutting boards and can be more difficult to clean. So this Christmas, give the cook of the family a cutting board, not just any cutting board, but a custom wood cutting board that will be cherished for a very long time. Every good cook should have butter at room temperature close by. If you do some searching, you can find butter dishes depicting whales, cows and even a Buddha butter dish. Good luck finding the perfect gift for the cook in your family. Should you decide that new kitchen countertops are a good idea, give A Polished Finish a call.